Along with the highly hyped Core i9-9900K, Intel announced this week a new line of high-end desktop chips in the form of Skylake-X Refresh and the 28-core Xeon W-3175X. Remember the 28-core processor? Yeah, the one Intel announced at Computex 2018 as being capable of 5 GHz, except only with what was later discovered to be exotic cooling and a ridiculous overkill motherboard. At the time you might have seen our article comparing Intel’s misleading 28-core demo to AMD’s announcement of 32-core Threadripper, a real product that ended up as the 2990WX. Ultimately, AMD's processor was released and it was a bit underwhelming in how it performs in some workloads, but the release did resemble closely what AMD had announced at Computex. So now let’s take a look at the final Intel Xeon 28-core CPU we're about to receive. The Xeon W-3175X is based on the Cascade Lake architecture, compatible only with Intel’s LGA3647 server socket, so those currently using X299 boards with the LGA2066 socket can’t just drop in this new CPU without a full platform upgrade. The Threadripper 2990WX was fully compatible with AMD’s Socket TR4 and X399 chipset, but Intel doesn’t have the luxury of socket compatibility with their high core count CPUs. In terms of specifications, the Xeon Platinum 8180 has 28 cores, 38.5MB of cache, 44 PCIe lanes direct to the CPU, and six-channel DDR4-2666 memory support, either ECC or standard. Sorry, did I say the Xeon Platinum 8180? Well I meant the Xeon W-3175X, which is a totally different CPU of course. The 3175X does beef things up a bit compared to the 8180 though, especially in terms of clock speeds. Intel’s totally different and not at all the same server chip is clocked at 2.5 GHz base with a boost up to 3.8 GHz, whereas the 3175X is clocked at 3.1 GHz base and 4.3 GHz boost. This also means a TDP increase from 205W to 255W, not because this is basically an overclocked 8180, but because of some other reason, but I digress. It’s also fully unlocked, like all of Intel’s HEDT processors. The key thing to note here is Intel’s 3175X is not clocked at 5.0 GHz, not as a base clock, not as an all core Turbo, and not even as a single core Turbo. And that’s, of course, because reaching 5.0 GHz on a 28 core CPU is completely ridiculous for typical operating conditions. Can the 3175X hit 5.0 GHz using exotic cooling? Well probably, but again this brings us back to Intel’s initial reveal of their 28-core HEDT chip: they showed it running at 5 GHz, plenty of websites gobbled that up without even questioning it, and yet here we are, the actual chip has been officially released, and it doesn’t clock anywhere near that mark. Intel did come out and apologized for not mentioning that their demo involved an overclocked CPU, but that whole setup left me and many of you with a sour taste in your mouth. 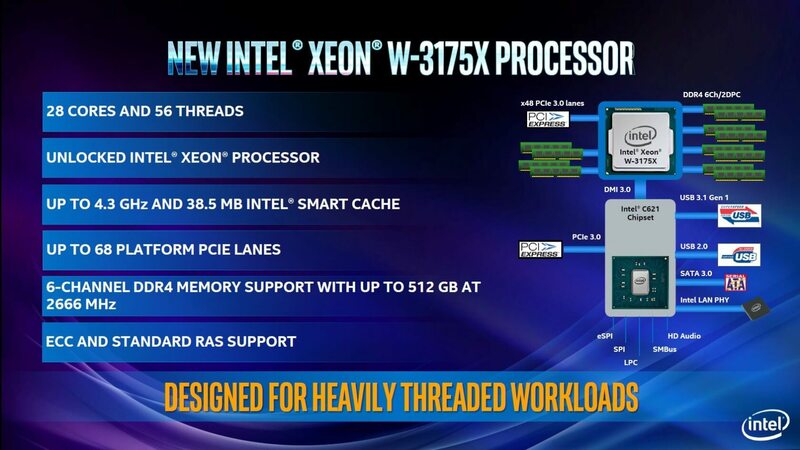 Now a key aspect to the Xeon's announcement is that pricing remains up in the air. Intel’s top end 18 core Skylake-X Refresh CPU, which we’ll get into in a moment, costs $2,000 or so, while the Xeon Platinum 8180 costs a cool $10,000. Considering the Xeon W-3175X is basically a better, higher clocked 8180, who knows what sort of price tag it will command. Will Intel price it above the 8180? Without a doubt it will be a very, very expensive product and who knows how competitive it will be against AMD’s 32-core offering. And then there are the motherboards built to support this processor, which appear virtually unchanged from what Intel used at Computex. The Asus ROG Dominus Extreme has two 24-pin power connectors, plus four 8-pin connectors, and two 6-pins, plus a monstrous VRM solution. It’s possible all those connectors are just to facilitate overclocking the chip, but that still seems like a ridiculous setup when again, the 2990WX works just fine on X399 boards and can be overclocked without needing two 24-pin connectors. And while we don’t have pricing for the Dominus, you can bet it will be very expensive to go along with the 3175X. So like we predicted at Computex, it seems like the 3175X is a marketing stunt and Intel’s attempt to have the world’s fastest single-socket CPU or something along those lines, because it’s highly unlikely that it will be a product worth purchasing for the vast majority of buyers. Even among those thinking of spending thousands of dollars just on a workstation CPU, this 28-core beast will almost certainly be much, much worse value than Intel’s LGA2066 products or AMD’s Threadripper. Moving on to Intel’s Skylake-X Refresh line, otherwise known as Basin Falls Refresh. What we have here is a selection of CPUs ranging from 8 cores and 16 threads, up to 18 cores and 36 threads, essentially replacing Skylake-X with equivalent parts. The 6 core i7-7800X doesn’t have a direct replacement with this refreshed line-up, instead the i7-9800X is an 8-core chip and it goes up from there. So there’s a couple of interesting things to note here spec wise. Nearly every part has received a clock speed boost, both to the base and boost clock. The 18 core i9-9980XE jumps from 2.5 GHz base and 4.4 GHz boost, to 3.0 GHz base and 4.5 GHz boost, within the same 165W TDP. Some chips have smaller bumps but generally we’re seeing gains from 100 to 400 MHz. While the TDP isn’t a good metric for power consumption, the fact the chips have higher base clocks under the same TDP could suggest better efficiency, possibly from manufacturing them on 14nm++ rather than 14nm+. We’ll have to test them to find out. Other interesting things are all chips now have a 165W TDP, previously the 12 core and lower were 140W, but now everything is the full 165W. L3 cache has also been improved for the 12-core and lower CPUs, jumping from as low as 11 MB in the 8-core i7-7820X, to 16.5 MB in the i7-9820X. The 8-core also gets a full 44 PCIe lanes, previously it was restricted to just 28 lanes, and I’m guessing this was done to give people a reason to buy it over the 8-core i9-9900K. The other somewhat unusual thing is the introduction of a second 10-core processor. It looks like this was done to keep the line-up at seven SKUs, but with Intel ditching the 6-core, they’ve had to double up one SKU. So the base model 9800X is now 8 cores, the 9820X is 10 cores, and the 9900X resumes normal proceedings at 10 cores as well. Considering all Skylake-X Refresh chips are unlocked, you’d think the higher-end 9900X wouldn’t be worth buying as it’s $100 more expensive, and only gives you clock speed boosts you could definitely achieve on the 9820X with overclocking. However the 9900X does feature more L3 cache which could come in handy depending on the workload; it won’t be a big deal for a lot of users, who likely will be better off with the 9820X, but there is at least one reason to go for the 9900X instead. With all of that out of the way, the most interesting thing to note here, is that Intel hasn’t been aggressive on pricing whatsoever. They’ve completely ignored AMD’s Threadripper platform, and gone with the exact same pricing they used for previous Skylake-X parts. The i9-9980XE is the same $1979 tray price as the i9-7980XE for example, and that holds true for the rest of the line. The only potentially better value product here is the $889 10-core i9-9820X, which offers a $100 saving on the 10-core i9-7900X, but that's about it. For example, AMD is currently selling the 16-core Threadripper 2950X for $900, which is a great buy as a versatile workstation CPU capable of handling most multi-core workloads with ease. Intel’s direct competitor is still just a 10-core CPU, which the 2950X will handily smoke in most workloads, whereas it’s the 14- and 16-core chips that will be much more competitive. Yet the 14-core is still priced at around $1400, $500 more than the 2950X, while the 16-core sets you back a huge $1700. AMD’s 32-core 2990WX which retails for $1800 will remain in competition with Intel’s 18-core i9-9980XE at $2,000. Neither of these chips are great value buys, but again it’s interesting that in the workloads where AMD’s multi-die design excels, like 3D modelling and rendering, Threadripper will still be offering much more performance at a lower cost. So a bit of a strange (or should we say arrogant?) launch here from Intel. We have new Skylake-X Refresh processors that don’t seem any more competitive against Threadripper than the previous generation, with only minor clock speed bumps at the same price, alongside a 28-core chip that will likely cost a sweet fortune and requires a ridiculous motherboard with loads of power connectors. Hard to say if Intel would have been better off simply keeping the original Skylake-X parts on the market and giving it a price cut and save themselves the engineering resources and be more competitive with AMD. But this is what we got instead.